Incorporating early literacy opportunities into the dramatic play center is fun and easy. 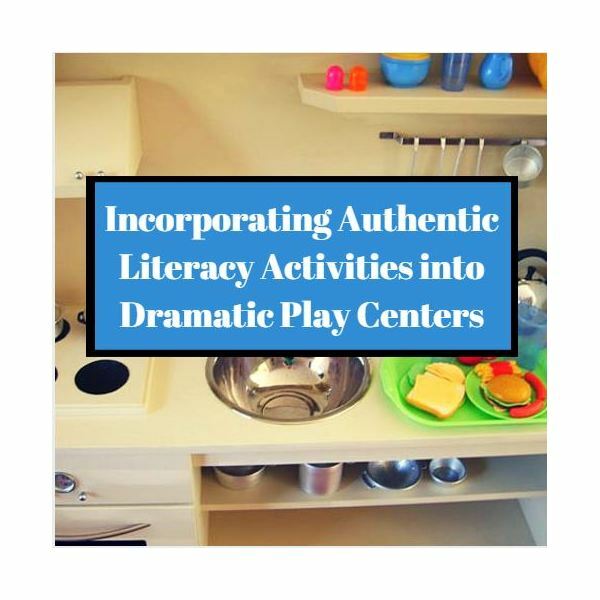 Theme-related picture books, authentic writing opportunities, environmental print and sound (phoneme) activities can all be a natural part of the dramatic play center. Following are some examples. Recommended books: Maisy Goes Shopping by Lucy Cousins, A Trip to the Grocery Store by Josie Koegh and At the Grocery Store by Carol Greene. Recommended books: Pizza at Sally’s by Monica Wellington, Working at a Restaurant by Katie Marsico, I Have a Restaurant by Ryan Afromsky. Labels for cupcakes, donuts, pastries, etc. Posters of body parts, etc. Recommended books: My Friend the Doctor by Joanna Cole, The Berenstain Bears Go to the Doctor by Stan and Jan Berenstain, A Day in the Life of a Doctor by Heather Adamson. Recommended books: The Post Office Book: Mail and How It Moves by Gail Gibbons, A Trip to the Post Office by Josie Keogh, To the Post Office with Mama by Sue Farrell. One way to spark the children’s interest in a reading and writing activity is to tap into what is important to them. Making a class book about their own pets at home is a great way to make it meaningful and applicable to their daily lives. Label the types of animals and have the children write each one a nametag. Provide information sheets on each pet and a price tag along with real or homemade containers of food with labels. Adding a cash register and pretend money helps to bring in some mathematical concepts as well. Recommended books: What Pet Should I Get? By Dr. Seuss, The Perfect Pet by Margie Palatini, Pet Show by Ezra Jack Keats. Asking questions, introducing new vocabulary and participating in natural think-alouds all help to advance the language skills of the children. Questions and statements such as, “I wonder what the Dalmatian likes to eat?” and “That puppy is miniature,” may trigger a child to look it up on the information sheets provided and also gives them an opportunity to hear new vocabulary in a meaningful way. Encouraging dialogue with comments such as, “I think my tummy is hurting, Doctor, what should I do?” and facilitating discussion between the children such as, “Bobby thinks he would like to have mushrooms on his pizza, can you ask him?” are effective ways to prompt and demonstrate appropriate use of language. Modeling joint interactions helps to teach the children the importance of language as well: what they say has meaning and can illicit responses from others. Remember to find ways to allow for real-world application of writing, theme related storybooks, environmental print, and new vocabulary by intentionally planning and setting up the environment for maximum success. Davidson, J. (1996). Emergent Literacy and Dramatic Play in Early Education. Albany, NY: Delmar Publishers.